The Computational Social Neuroscience Lab is located in the Department of Psychology at UCLA.We study how our brains allow us to represent and navigate the social world. We take a multidisciplinary approach to research that integrates theory and methods from cognitive neuroscience, machine learning, social network analysis, and social psychology. A detailed, lay overview has been written up in the New York Times: You Share Everything With Your Bestie. Even Brain Waves. The study took a cohort (N = 279) of graduate students in a graduate program. Students were asked to list who their friends were, from which a social network was constructed. A subset (N = 42) of these students were then asked to watch a series of videos while their brains were being monitored by an fMRI machine. 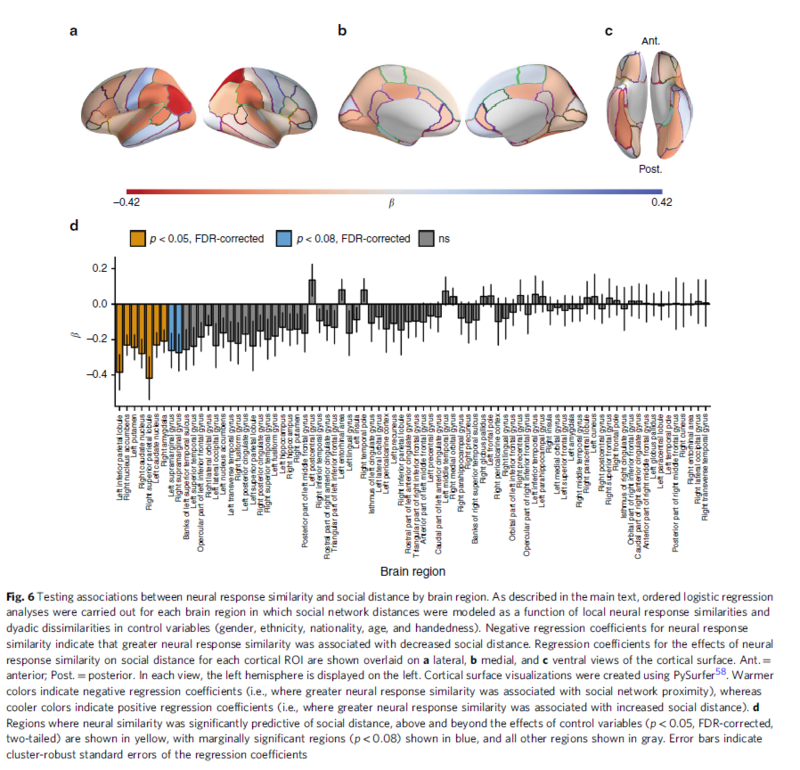 The timings of brain activations across 80 regions of the brain were compared to see if there were similarities that correlated with social distance. Statistically significant similarities exist such that friends could be identified by firing patterns and timing. Particularly, individuals with one degree of separation were strongly resonant(? ), while individuals with three or more degrees of separation could not be discriminated by fMRI. This is more support for the idea that groups of people “flock” in latent belief space. If everyone fired in the same way to the videos, then the environmental influence would have been dominant – a video of a sloth or a volcano is “objectively” interpreted across a population. Instead, the interpretation of the videos is clustered around individuals with high levels of social connection. Humans spontaneously form groups of preferred sizes organized in a geometrical series approximating 3–5, 9–15, 30–45, etc. This is remarkably similar to the numbers found in social organizations such as flocks of starlings (seven). As we’ve seen in multiple studies, a certain amount of social cohesion is beneficial as away of finding resources in a noisy environment (Grunbaum), so this implies that belief space is noisy, but that beneficial beliefs can be found using similar means. Grunbaum also finds that excessive social cohesion (stampedes) decrease the ability to find resources. Determining the balance of explore/exploit with respect to depending on your neighbors/friends is uncomputable, but exploration is computationally more expensive than exploitation, so the pressure is always towards some level of stampede. This means that in physical and belief spaces, the density and stiffness of connections controls the behavior of the social network. By adjusting the dial on the similarity aspect (increasing/decreasing stiffness of the links) should result in nomadic, flocking and stampeding behavior in belief space. There is a second layer on top of this which may be more important. How individuals respond to social cues (which can have significant survival value in a social animal) may be more important than day-to-day reactions to the physical environment. I wonder if this changes as people age. Are there gender differences? I think this might make the influence more environmental than social. It would be interesting to see how a strongly aligned group would deal with a polarizing topic, even something like sports. 80 possible dimensions. It would be interesting to see this in latent space. That being said, there is no dialog here, so no consensus building, which implies no dimension reduction. To test for a relationship between fMRI response similarity and social distance, a dyad-level regression model was used. Models were specified either as ordered logistic regressions with categorical social distance as the dependent variable or as logistic regression with a binary indicator of reciprocated friendship as the dependent variable. We account for the dependence structure of the dyadic data (i.e., the fact that each fMRI subject is involved in multiple dyads), which would otherwise underestimate the standard errors and increase the risk of type 1 error , by clustering simultaneously on both members of each dyad [21, 22]. So the latent space that matters involves something on the order of 7 – 9 regions? I wonder if the actions across regions are similar enough to reduce further. I need to look up what each region does. Does this change with the level of similarity in the group? This entry was posted in Lit Review, Uncategorized on November 12, 2018 by pgfeldman.